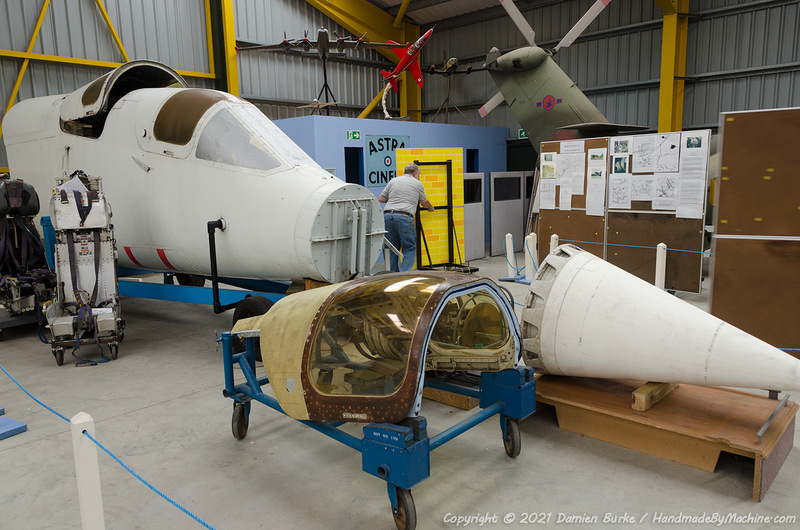 This TSR2 nose section was built using production jigs and was intended to be used for ejection seat and air conditioning trials. After the programme's cancellation it continued in use at RAE Farnborough for thermal and materials tests in the Concorde programme, ending its days being used for birdstrike trials. These consisted of firing bird carcasses at various speeds into the windscreen area. Relegated to the Farnborough dump, she was rescued by the Brooklands Museum, cosmetically refurbished and put on display. Inspection finds it to bear only superficial resemblance to a 'real' TSR2 nose - the appearance here is much more agricultural with big rivets and structural ironwork under the floor. The cylindrical projection near the front of the nose was a mounting point for the original stand, enabling rotation to various angles for blower tunnel escape system tests. The nose was moved to Farnborough, apparently to be re-united with a radome, back in late 2010 but instead languished in a compound round the back for a while before returning to Brooklands, and then being placed on loan to the Newark Air Museum in time for the TSR2 50th anniversary event on 27th September 2014. She's seen displayed along with the radome and a TFR unit. The rear canopy was opened up for the event, revealing the cockpit interior which is basically a space model - a wooden facsimile of an ejector seat and basic panels made up from plywood and metal. She remain at Newark for a short time before returning to Brooklands where she is now back on external display and suffering from the elements once more.